Security Council President Amb. Agshin Mehdiyev reads press statement on Syria. Secretary-General Ban Ki-moon and the United Nations Security Council have strongly condemned deadly bomb attacks in Damascus today, and called for an end to the ongoing violence in the Middle Eastern country. “The Secretary-General reiterates his urgent call on all sides fully to comply with their obligations to cease armed violence in all its forms, and to protect civilians, as well as to distance themselves from indiscriminate bombings and other terrorist acts,” Mr. Ban’s spokesperson said in information provided to the media. According to media reports, there were two strong explosions in the Syrian capital – near what is reported to be a military intelligence building – on Thursday morning, killing or wounding dozens of people. The crisis in Syria, which began in March 2011 as a protest movement similar to those across the Middle East and North Africa, has claimed over 9,000 lives, mostly civilians, and displaced tens of thousands. Mr. Ban also called for all sides to abide by Security Council resolution 2043 and the six-point plan, which commits the parties to a peaceful resolution of the crisis, put forward in March by the Joint Special Envoy for the United Nations and the League of Arab States for the Syrian crisis, Kofi Annan. In a statement to the press, the Council President for the month of May, Ambassador Agshin Mehdivev of Azerbaijan, expressed a similar position. “The members of the Security Council called upon all parties in Syria immediately and comprehensively to implement all elements of the Joint Special Envoy six-point proposal, in conformity with resolutions 2042 and 2043, and in particular to cease all armed violence in all its forms,” Ambassador Mehdivev said. In this regard, he added, the Council members reaffirmed their full support for the UN Supervision Mission in Syria (UNSMIS) and Joint Special Envoy Annan. Authorized by the Council last month under resolution 2043, UNSMIS is tasked with monitoring the cessation of violence in Syria and supporting the full implementation of Mr. Annan’s six-point plan. The plan calls for an end to violence, access for humanitarian agencies to provide relief to those in need, the release of detainees, the start of inclusive political dialogue that takes into account the aspirations of the Syrian people, and unrestricted access to the country for the international media. “The United Nations is committed to continue doing all it can to achieve these goals,” Mr. Ban’s spokesperson added. In its press statement, the Security Council reaffirmed that terrorism, in all its forms and manifestations, constitutes one of the most serious threats to international peace and security, and that any acts of terrorism are criminal and unjustifiable, regardless of their motivation, wherever, whenever and by whomsoever committed. The Council members also reaffirmed their determination to combat all forms of terrorism, in accordance with their responsibilities under the UN Charter. Both Mr. Ban and the Security Council expressed their sympathy for the victims of the attacks and to their families. Earlier Thursday, Joint Special Envoy Annan condemned “in the strongest possible terms” the bomb attacks, while UNSMIS’s head, Major-General Robert Mood, visited the site of the blasts. On Wednesday, a bomb blast went off in the vicinity of a convoy of UNSMIS observers, injuring several Syrian soldiers accompanying the delegation, which had been approaching the southern city of Dar’a. Major-General Mood had been leading the delegation at the time of the explosion. 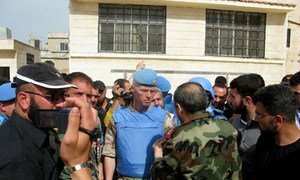 Secretary-General Ban Ki-moon has condemned a bomb explosion which occurred in the vicinity of a convoy of UN observers in Syria, injuring several Syrian soldiers accompanying the delegation, Mr. Ban’s spokesperson said today.